Gros ouvrage broché, reliure toilée, 28,5 x 23,5 cm, 2,410 Kg. 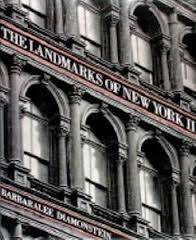 This latest edition of the acclaimed LANDMARKS OF NEW YORK expands upon the official landmarks and historic districts documented in two previous volumes and incorporates a completely new section of more than 100 recently designated landmark buildings, interiors, and 12 historic districts. The landmarks are arranged chronologically by date of construction and provide an overview of the city over three centuries. More than 900 illustrations, 73 maps. Livre neuf. Une rayure localisée au bas de la jaquette papier arrière (lors stockage).